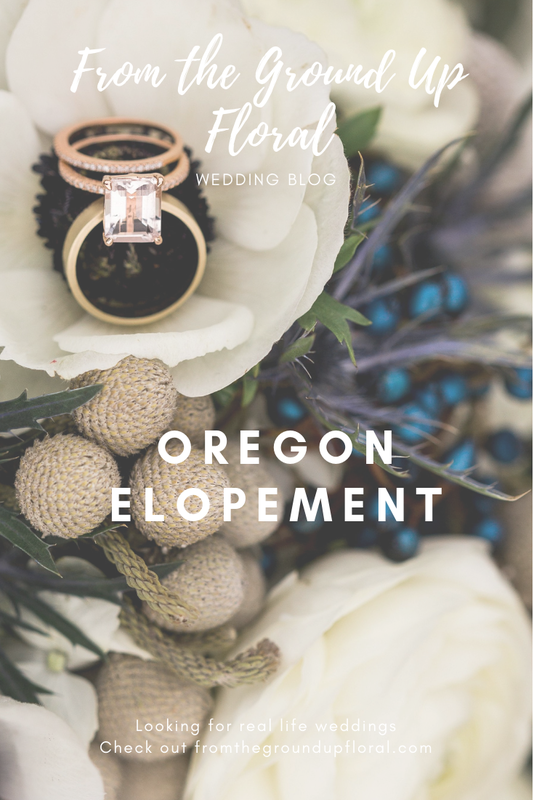 An Elopement Bouquet to take to Oregon?…Not a problem at all! I got an email from Megan, of Megan Montalvo Photography. Asking if I had a elopement package. Of course I do! I actually love doing elopements and small pick up weddings. I think it is fun to do something where I can focus a lot of energy in capturing just the intimate pieces of a wedding. This is the story of their elopement. I met with Cheyanne’s parents in Tacoma to send off their floral pieces. I got a feel for Cheyanne’s ideas and inspiration through email only. I love how she chose the blue, with black, white and grey. I added in different shades of blue in the ribbon. I think it perfectly matched the Oregon coast. This one is close to my heart. I also got married on the Oregon coast, further south, but the shades, colors, look and feel is so familiar and brings a smile to my face. They met at Cape Kiwanda State Park in Pacific City, Oregon at one of the most stunning locations ever! Battled a one hour window of clear skies during a rainy Pacific Northwest day. What was most loveable about these two was the fact that they didn't let the sprinkles or wind change the fact that they were celebrating their union and the beginning of a new life together. What is your guy’s backstory? Matt and I met in middle school and began dating in 10th grade of high school and have been together nearly 7 years. He would say that he liked me from the very beginning, and even attempted to ask me out in seventh grade. As a couple, we've experienced a lot. From becoming adults, going off to college/going into the military to the normal ups and downs of relationships. When Matt joined the Army and went off to BCT, I was in the second semester of my masters degree. As a couple, it was one of the times were we felt most heard and connected - There's something about writing letters! For our elopement, we would like something romantic and intimate. I'm very simple. I always said that if we ended up having a courthouse wedding, I wanted two things: A dress that I loved, and a phenomenal photographer. Best take away from eloping? I learned how peaceful marriage can be. Honestly, I worried about the commitment of marriage and what it meant to be "always and forever." However, when I heard Matt say his vows, and I say the same ones, I felt completely at peace and it hasn't changed since. I'm lucky to have married my best friend. Cheyanne’s awesome review on the Knot. To anyone reading this, Gina is phenomenal! I was planning an elopement in Ruby Beach, WA (from Florida, I might add), and in desperate need to find a florist because mine had stopped communicating altogether. My photographer contacted Gina two weeks out, and she was very quick to respond. More importantly, she understood our vision for the "big day". When I saw the flowers for the first time, I was blown away - From how they looked, to the size of the bouquet, to the various flowers and leaves, I was in love. In short, i would highly recommend Gina! And the hand-dyed silk ribbon (she made one that was half blue/ivory -- To dye for)! We’ll be back soon with more love stories!